This unique corner mount unit is designed for direct downward and outward illumination. 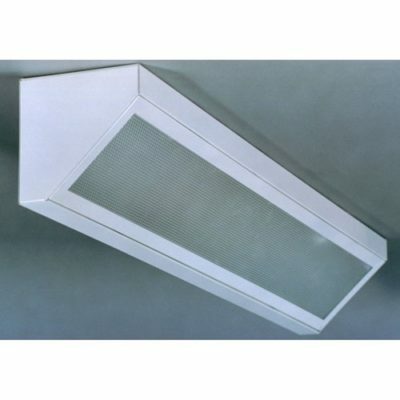 The ANG can also be used as cove lighting for indirect upward and outward illumination. 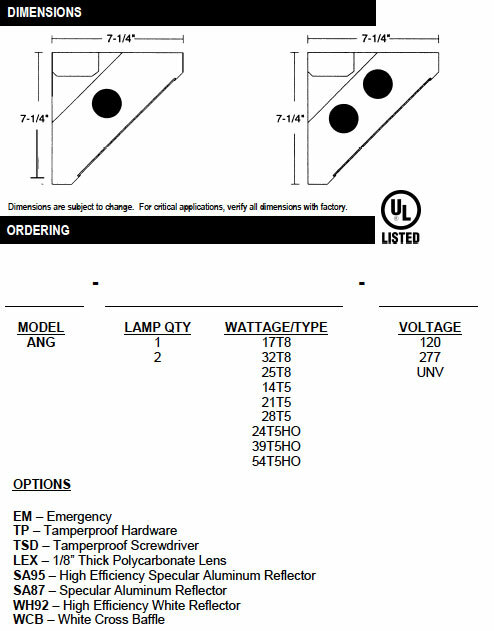 Available in 2’, 3’, and 4’ lengths, in 1, and 2 lamp configurations, T5, T5HO and T8. For individual or row mounting. Available in custom finishes to match most décor. Available with energy-efficient reflectors in High Efficiency Aluminum (95% reflectance), Specular Aluminum (87% reflective), and High Efficiency White (92% reflectance). Die-formed, heavy gauge steel housing and ends unitized into one piece. Acrylic prismatic lens is standard. All metal parts are painted after fabrication with premium white enamel with a minimum of 89% reflectance, applied over ion phosphate pretreatment, for maximum adhesion and rust resistance.